Around this time of year, high schoolers all around the U.S. are constantly refreshing their emails, anxiously awaiting the decisions of their top choice colleges. For select students, the hours spent studying for standardized tests, writing the perfect essay, obtaining the best grades and pouring any free time into extracurriculars are seen as compulsory to receive the acceptance letter of their first choice college. College is a privilege, and the end goal for college bound high schoolers today is to get into one of their choice. However, for select students, the obsession of getting into their top colleges, often elite ones, dominates their life. Students that strive to attend elite universities should acknowledge that their worth in life is not based on college admission results, but rather the effect they have made as people of society. Students stressing over every aspect of their application is due to the plummeting acceptance rates at elite schools. With many elite schools declining 90 to 95 percent of their applicants, students with a strong desire to attend that school may fill their application with extracurriculars they may not enjoy and take unnecessary AP classes of which they have no interest in. This creates a culture in students, where they only pursue activities to increase the competitiveness of their application, not because those said activities bring them joy. This can be seen in the case of Lena Felton, a Harvard student who responded that “High school, for me, was all about doing as much as I could (often to pad my college app),” in an interview for Harvard’s commonly asked questions about student life. While this is common to see, it highlights a major flaw in the motives for completing activities: students in high should be following their own interests and making the most as a teenager, not just padding up their application in hopes to impress colleges. Through this mentality, students are also pushed into a life of all work and no play. They insist that every single quiz, test, missed homework, loss at an athletic game, or poor performance will make or break their application, often leading to obsessions and unnecessary stress. 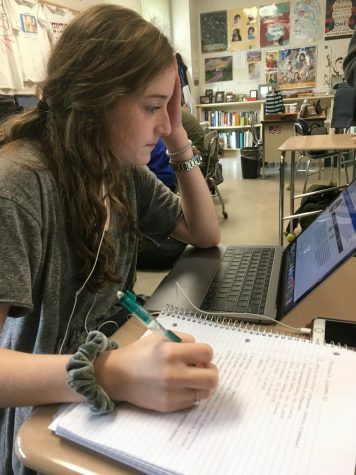 These students spend hours turning an 89 into a 90 and getting SAT scores in the interquartile range of the college, ultimately filling up their weekends and vacations with extracurriculars and studying. These efforts may not even be effective and leads to abundant amounts of stress and the feeling that one is running an endless race. In fact, in a survey conducted by the American Psychological Association, the most common stressors are school for 83 percent of teens and getting into a good college or deciding what to do after high school for 69 percent of teens. High school students persistent on going to elite schools may also view colleges as the prize of their accomplishments rather than as a responsibility to themselves and the community to become educated. A student’s self worth and summations of their achievements does not come from the a single letter admitting or denying them acceptance to a college, instead it comes from how they view themselves. To combat this growing culture, colleges can limit the amount of extracurriculars one can place on their application, decrease the importance of test scores and encourage students to only take AP classes for subjects they are interested in. By doing so, students will focus on strengthening their applications with their own interests rather than packing it with filler activities. Students hoping to gain admission into high tier colleges should continue to pursue their goals, but not allow them to dictate their lives. It is time to make sure that high achieving students not only are encouraged to attend elite universities but also to become exceptional people, using generosity and humanity, in hopes to better society as well as themselves.